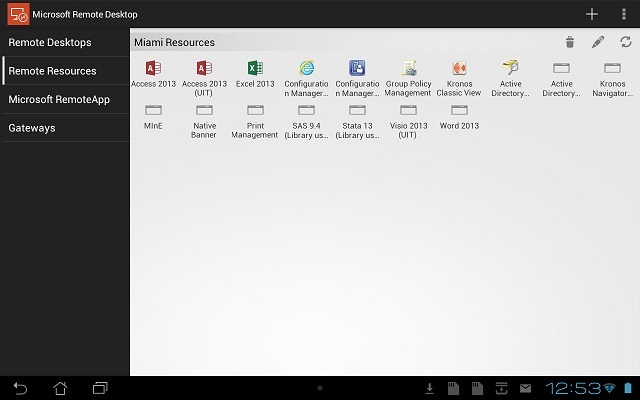 If you are using a Mac, iOS or Android device you will first need to install the Microsoft Remote Desktop application. Click the green Get Remote Desktop button to download and install the Microsoft Remote Desktop application from the Google Play store. Launch Microsoft Remote Desktop and choose Remote Resources. In the User Name field, enter your Miami UniqueID, prepended with the IT domain and a backslash (\). In the Password field, enter your Miami password. Tap Done. A list of remote applications that are available to you should appear in the window. The default save location for files is in the Windows Profile on the RDS servers, but there is no mechanism to retrieve files from this location. When saving PDF versions of MInE reports, change the save location in the Save As dialog box, selecting either a local drive or a network drive. Check out this service request I found in the IT @ Miami service catalog. https://miamioh.teamdynamix.com/TDClient/Requests/ServiceDet?ID=10940 Configuring AppPortal Applications and Desktops for Android Devices Miami's AppPortal Applications technology streams applications to your computer or device, making the application appear as if it is running from your computer or device. This technology relies on Microsoft's RemoteApp and Desktop Services. AppPortal technology provides access to Banner, MInE, & Kronos, as well as access to Windows applications for Mac users and CSE 148 students.